Happy Thursday, everyone, from the world-wide headquarters (WWHQ) of the Corvallis Knights, your 2016 West Coast League champions! Poor weather quality in the Wenatchee Valley forced the postponement of Wednesday night’s scheduled doubleheader between the Knights and Wenatchee AppleSox at Paul Thomas Sr. Stadium. With no improvement expected in the immediate future, the teams have moved their West Coast League series to Corvallis. They will play a 6 p.m. doubleheader tonight at Goss Stadium. Both games are scheduled for seven innings. All tickets and concession items will be $1. Gates open at 5:30 p.m. Right-handers Connor Redmond of Cal Poly and Trenton Toplikar of UC Riverside are the probable starting pitchers the Knights. The teams were also postponed on Tuesday, so the series will be only two games, not three. If the unplayed third game impacts the WCL playoff standings, the teams will play a makeup game at 7:05 p.m. Monday at Paul Thomas Sr. Stadium. We complete the regular season by hosting Yakima Valley this Friday through Sunday. We have promotions planned for each night. Friday is our Salute to OSU Baseball, and our Brooke Knight Bobblehead Night, presented by Coral Construction. The first 500 fans receive a bobblehead of our popular head coach. It is also a Fred Meyer Family Friday. Families can get vouchers at Fred Meyer stores in Corvallis and Albany to be redeemed for four reserved seats, four soft drinks, four hot dogs and four popcorns for only $44. Saturday is Pioneer Fireworks Night, our third and final fireworks show of the summer. Please note the 7:15 p.m. starting time. Sunday is Wilson Motors Buyout the Ballpark Night and Hilton Garden Inn Fan Appreciation Night. Get your free ticket at Wilson Motors, on the corner of 5th Street and Buchanan Avenue. Also, Junior Knights Club members get in free. The playoffs begin Tuesday. Tickets for our WCL Divisional Series home playoff game set for next Wednesday are now available. The WCL playoffs are powered by Pioneer. For tickets, click here; for more information, click here. Infielder/outfielder Tyler Malone will miss the rest of the season because of injury. The rising sophomore at Oregon State hit .135 (5-37) in 13 WCL games, with two RBIs. The July 29 game with the Oregon Collegiate Baseball League all-stars drew a crowd of 1,685. That raised our season attendance to 41,903 in 29 dates, an average of 1,445 per opening. We are 728 fans behind last year’s attendance through a corresponding number of home dates. Time to update the stats of our alums in affiliated baseball. We do the position players on Thursday and the pitchers on Friday. TAYLOR ARD (AA Jacksonville, Marlins): The utility player from Mt. Hood/Washington State (2009) is hitting .218 (64-294) in 98 games, with eight homers and 38 RBIs. ANDY COSGROVE (R Elizabethton, Twins): The catcher from Washington/North Carolina State (2014) is hitting .182 (8-44) in 12 games, with a homer and six RBIs. BLAKE DRAKE (A Palm Beach, Cardinals): The outfielder from Concordia (2013) is hitting .242 (57-236) in 61 games, with six homers and 23 RBIs. NATE ESPOSITO (AAA Omaha, Royals): The catcher from Oregon State (2012) is hitting .167 (2-12) in four games, with no homers or RBIs. ROCKY GALE (AAA El Paso, Padres): The catcher from Portland (2007, 2009) is hitting .282 (75-266) in 81 games, with a homer and 30 RBIs. ROMAN GARCIA (R Greeneville, Astros): The first baseman from San Diego (2016) is hitting .222 (20-90) in 25 games, with three homers and 15 RBIs. CADE GOTTA (AA Montgomery, Rays): The outfielder from San Diego Christian (2011) is hitting .288 (75-260) in 69 games, with five homers and 39 RBIs. KJ HARRISON (R Helena, Brewers): The first baseman from Oregon State (2015) is hitting .327 (17-52) in 14 games, with a homer and eight RBIs. DANNY HAYES (AAA Charlotte, White Sox): The first baseman from Oregon State (2010) is hitting .225 (80-355) in101 games, with 16 homers and 59 RBIs. LOGAN ICE (A Lake County, Indians): The catcher from Oregon State (2014) is hitting .230 (56-243) in 71 games, with eight homers and 32 RBIs. DALTON KELLY (AA Montgomery, Rays): The outfielder from UC Santa Barbara (2014) is hitting .360 (40-111) in 30 games, with seven homers and 26 RBIs. CHRIS RABAGO (A Lancaster, Rockies): The catcher from UC Irvine (2012-13) is hitting .260 (60-231) in 69 games, with one homer and 34 RBIs. CHRIS SHAW (A Delmarva, Orioles): The catcher from Midland CC (2014) is hitting .205 (18-88) in 23 games, with two homers and 13 RBIs. ANDREW SUSAC (AAA Colorado Springs, Brewers): The catcher from Oregon State (2009) is hitting .205 (35-171) in 51 games, with seven homers and 35 RBIs. NICK TORRES (AA San Antonio, Padres): The outfielder from Cal Poly (2012) is hitting .264 (91-345) in 90 games, with eight homers and 46 RBIs. PETER VAN GANSEN (AAA El Paso, Padres): The infielder from Cal Poly (2013) is hitting .281 (9-32) in 11 games, with no homers and six RBIs. KEVIN WATSON (ARL DIAMONDBACKS): The outfielder from Beaverton HS (2017) is hitting .174 (4-23) in seven games, with no homers or RBIs. CALEB WHALEN (A Carolina, Brewers): The infielder from Portland (2012) is hitting .250 (1-4) in one game, with no homers or RBIs. 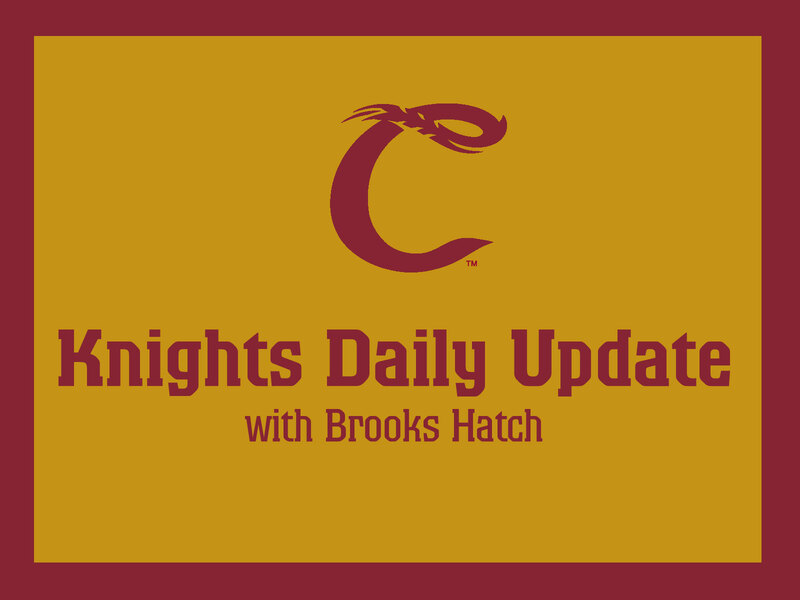 No Knights Minor League Player of the Day today. Most of the leagues had last night off. That’s all for today. Have a great week, see you at Goss Stadium tonight, back here on Friday morning, and at Goss Stadium again on Friday, Saturday and Sunday nights.